Miners Alley | What's Happening in Golden? The 6th Annual Great Turkey Chase takes place tomorrow morning at 8:30. This is a family fun run along Clear Creek, organized by Runners High. If you want to participate, stop by the store at 2221 Ford St. between 11AM and 5PM today to sign up. More information…. The Be A Tool 5K Elf Run takes place this Saturday morning. This supports the Neighborhood Rehab project, which helps people fix their houses so they can stay warm, safe, and dry. It’s also a lot of fun, because people dress up as elves. Learn more! On a more sedentary note, you can see Miners Alley’s latest version of A Christmas Carol this evening at 7:30. This is their preview performance, and you can see it for only $15! Christmas shows sell out closer to the holiday, so why don’t you seize this opportunity to be the first on your block to see it? This is the final weekend to see Lend Me a Tenor at Miners Alley. Performances are at 7:30 tonight, Friday, and Saturday, and at 2PM on Sunday. The Library is hosting Let’s Dance from 11:15-11:45 this morning, for preschoolers and toddlers. Let’s dance! Shake those wiggles out and have some fun building little brains! All families are welcome. The Library’s High-Voltage Book Group (School Age / Tweens) will discuss Upside Down Magic from 3:30-4:30. Your books come to life at the library! Read the book on your own, then together we conduct science experiments and build gadgets from the book. The final ED Talks: Minerals Worth Sharing of the summer will take place at 4PM today at the Arthur Lakes Library on the CSM campus. Ed Raines will present an in-depth look a the most significant Mining Districts of Colorado. Today he’s covering the Geology of Gilman. 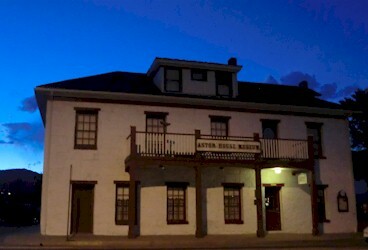 The Golden Ghost Tour & Haunted Pub Crawl will meet at 7:15 tonight in front of the Old Capitol Grill & Smokehouse. This is the last occurence that’s currently scheduled. 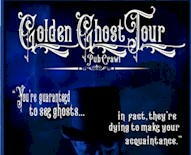 You must buy your tickets in advance through their webpage. City Council meets tonight at 6:30 in City Council Chambers. They will discuss a proposed ordinance to lower the voting age for voting in municipal elections to include 16 and 17 year olds. They will also review the bids for the North Washington Avenue complete street project and decide whether to award the bid based on the complete project or only to section from Iowa Street to Highway 58. After the business meeting they will hold a study session regarding the 2019-2020 Capital Improvement Plan. More info…. Earth Sweet Botanicals has a couple of openings in tonight’s 7PM cooking class, Seed-y Kitchen Practices. Seeds and nuts are nutritional powerhouses. But are you eating them correctly to effectively experience their benefits? We’ll crack the secrets for how to get the most bang for your buck. Call the store to reserve a spot: 303-278-1260. Plan to come downtown tomorrow night from Golden Weekends from 5-8PM. That means carriage rides, street musicians, and sales, specials, and samples in the stores. There’s also Movies and Music in Parfet Park to look forward to, starting at 7. Stone Beat Invasion is a tribute band to the Rolling Stones and the Beatles. This will be followed by a sing-along version of Beauty and the Beast. Foothills Art Center is the place to be tonight. At 6PM, they’re doing a members-only preview of their new exhibit–Amuse Yeux: A Small Delight For The Eyes. This exhibit is a mixed media small works show which will present the visual equivalent in a refined gallery setting. The motivation for this show was to provide an opportunity for young adults in our community to begin art collections at an entry-level price point, having work for sale and priced at $300 or below. From 7-8:30PM, they’re co-hosting a public forum, in partnership with Golden United, to discuss actions that will maintain affordable housing in Golden and preserve the city’s unique small-town character. The forum will focus on measures that the city can pursue as well as actions that residents and businesses can take to address these coupled goals. The venue is appropriate for this discussion, since Foothills has been running a major exhibit called “Finding Home,” about housing issues. Affordable Housing is a contentious issue. Some people feel that any society has an obligation to ensure that everyone is decently housed. Others feel that they work hard to pay for their own housing and feel no obligation to subsidize housing for others. Some people feel that Golden needs a range of housing options so that people of all income levels can live here. Others feel that there are towns where they can’t afford to live–so they don’t. They don’t expect those towns to build housing for them. Some feel that most current low-income housing in Golden is sub-standard and people should live in clean, safe, energy-efficient places. Others recall the various ways they lived when their incomes were low: they lived with their parents, they had roommates, they lived in run-down places. They see sub-standard housing as the natural place to start–they started there, and eventually moved up the housing chain. Some feel that a kind and decent person would support Affordable Housing. Others resent being stigmatized because they’re unenthused about it. Then there are the Golden-specific issues. Some residents feel that Council made the decision to add Affordable Housing to the Comprehensive Plan with no real mandate from the citizens. The Investment Task Force report lends some support to that idea, in that only about 28% of respondents wanted to invest in Affordable Housing. Others think Affordable Housing is necessary to keep Golden a warm and welcoming place with a vibrant economy, and if market forces are making Golden real estate too expensive, the City government needs to step in and take steps to guarantee a range of housing options. Some residents are concerned that, while the Comprehensive Plan talks about preserving our current stock of Affordable Housing, the planning discussions focus on building new Affordable Housing. The Plan calls for Affordable Housing to be distributed around town, but in practical terms it’s unlikely that Affordable Housing will ever be integrated into Beverley Heights, Mesa Meadows, Stonebridge, Canyon Point, Trip Ranch, or near the golf course. Those neighborhoods have HOAs or PUCs or are completely built up with high-end homes. This means that the remaining neighborhoods are likely to absorb all Affordable Housing. This imbalance is galling to citizens who do not live in protected areas. Tonight’s forum intends to provide a discussion of actions that will maintain affordable housing in Golden and preserve the city’s unique small town character. The forum will focus on measures that the city can pursue as well as actions that residents and businesses can take to address these coupled goals. The forum will seek to identify a couple of priority actions reflecting shared interest across the community and define next steps to help advance these top priorities. I plan to be there to participate in the discussion. I hope you will too. 7-8:30PM TONIGHT at Foothills Art Center, 809 15th Street (map). The School of Mines is hosting another EDTalks today at 4PM at the Arthur Lakes Library, 1400 Illinois St. Ed Raines presents an in-depth look a the most significant Mining Districts of Colorado with talks focusing on History & Geology on select Thursdays in June and August. Learn more…. From 6-7PM, the Arthur Lakes Library presents “Magic & Mind Reading”, a mysterious journey through the world of Magic and Mind Reading featuring Magician Jon Pierce and Mind Reader and Magician Edward Hammond. Learn more…. Foothills Running and Cycling Club is having their Goat Challenge #2. Learn more…. This is the last weekend to see District Merchants at Miners Alley. I saw it last weekend, and it was really interesting. Performances at Thursday, Friday, and Saturday at 7:30 and Sunday at 2. Learn more…. The Job Fair for Origin Hotel Red Rocks is going on at the Community Center today and tomorrow from 10AM-7PM. Learn more…. The 8th Annual Golden Games start this afternoon. Should be lots of fun things to watch along the Creek–stand up paddling, kayaking, and slack lining for all levels of expertise. See the schedule to see what’s happening when. CoorsTek has a job fair this afternoon from 1-3PM at 600 9th St. Learn more…. If you don’t see a video above, you can view it on YouTube. The Library has Teens After Dark: Smoothies of Doom from 5-6 tonight. Test your trivia skills and taste buds in this game of food and knowledge! The host asks a trivia question, if your team gets the wrong answer, your blender gets a surprise ingredient. If your team gets the correct answer, you’re off the hook! 9AM at the Golden Community Garden – 2nd Annual Plant Sale. Sales goes until they run out of plants! 2-3:30PM Golden History Roundtable at the Golden Library. Barb Warden will talk about the Railroads of Golden. Galloping Goose train rides at the Railroad Museum from 10AM-4PM. Pied Piper of Hamelin at the Miners Alley Children’s Theater at 1PM. Home Depot class on Paint Trends & Tips from 10-11AM. Natural Grocers class on Avocado Awesomeness from 10-10:45, and another on How to Cure Heartburn from 12-1PM. Fun Home at Miners Alley at 7:30. Don’t forget this morning’s book discussion at the Golden History Park (formerly the Clear Creek History Park). The topic is “Where Do We Go From Here?”: America in the First World War. That’s 11:30-12:30. The Golden Chamber is having their annual awards banquet tonight. Congratulations to these award recipients! Bentgate is having their monthly Backcountry 101 Session with Salomon tonight from 6:15-7:15. The West Denver Chapter of Trout Unlimited meets tonight from 6:30-8:45 at the Mountaineering Center. Miners Aley has improv comedy tonight: What happens when a traditional theatrical scene is “flipped” with improvisational actors? Winning the 2017 Henry award for “Outstanding Improvisational Theatre,” SCRIPTprov™ has also been described as a “wonderful surprise” and “redefining the rules.” We put improv in their scripts; they put scripts in our improv. Hilarity ensues. $15. On Thursday evening during City Council, the Mayor will issue a proclamation, officially recognizing February as Heart and Soul of Golden month. I hope you’re getting to attend some of these events. Do you have a toddler? The Library has Toddler TIme every Tuesday-Friday morning at 10:15; Dinosaur Ridge has TriceraTOTs tomorrow morning at 10, and the Library has a Toddler Dance Party on Thursday morning. Like history? The Golden History Museum is hosting a book discussion about World War I tomorrow at 11:30 at the Golden History Park. Tomorrow night, Miners Alley is hosting SCRIPTprvo (improvisational comedy) at 7:30. The application process for becoming a volunteer firefighter for the City of Golden is coming to a close. You have until Friday, Dec. 15th at 5:00 PM to apply. The applications are on the city website www.cityofgolden.net. Tomorrow night at 6:30, the City will hold a meeting at Golden High School concerning a Sexually Violent Predator who has moved to the community. For more information, call the Golden Police Department at 303-384-8045. Miners Alley will host Scriptprov tomorrow night at 7:30. What happens when a traditional theatrical scene is “flipped” with improvisational actors? Winning the 2017 Henry award for “Outstanding Improvisational Theatre,” SCRIPTprov™ has also been described as a “wonderful surprise” and “redefining the rules.” We put improv in their scripts; they put scripts in our improv. Hilarity ensues. $17.